JC9748. Calcite, barite. Holzen, Arnsberg, Sauerland, North Rhine-Westphalia, Germany. 3 x 5 cm 27g. $15.00 No obvious damage. JC9748. A slightly different angle. JC9673. Calcite (Cobaltoan). Musonoi mine?, Kolwezi district, Katanga, Democratic Republic of the Congo. 10 x 11 cm 727g. $300.00. Brilliant, intense magenta pink crystals heavily coating the matrix. 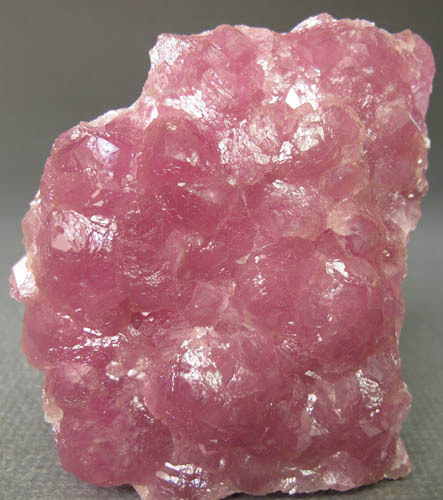 A great display specimen with the intense magenta colored crystals. JC9363. Calcite (cobaltoan). Kolwezi district, Katanga, Democratic Republic of Congo (Zaire). 6 x 10 cm 182g. $80.00. Bright, sparkly crystals in a shallow vug. Sawn back. JC9354. Calcite (cobaltoan), malachite. Kolwezi, Katanga Copper Crescent, Katanga, Democratic Republic of Congo (Zaire). 8 x 11.5 cm 358g. $75.00. Nice piece with bright pink/magenta crystals. A little bit of interstitial malachite is present on the left side. JC9318. Calcite (cobaltoan). Kambove District, Katanga, Congo (Democratic Republic) (former Zaire). 5 x 8 cm 213g. $200.00. Hot pink, somewhat skewed rhombohedral crystals. JC9212. Calcite (cobaltoan). Mashamba West mine, Kolwezi district, Katanga, Democratic Republic of Congo (Zaire). 6 x 7 cm 227g. $275.00. A rare color for these, which are usually more magenta. This one is magenta with a purple over tint which creates a really odd color. From the Uri Bahman collection, who kept this one back for quite a while due to the odd color. JC9145. Calcite. Red Dome mine, Mungana, Mareeba Shire, Queensland, Australia. 6 x 8 cm 193g. $75.00 These came out about 2001. Some of the best Australian calcites I have ever seen. Group of modified scalenohedral crystals, nicely translucent to gemmy, some with a hint of iron staining, on a corroded older generation calcite. I have 4 of these I held back from this find and finally decided to let them go. They are shown here. No damage. JC8945. Calcite, hematite. Dal'negorsk, Kavalerovo mining district, Primorskiy Kray, Far-Eastern region, Russia. 2.5 x 4 cm 16g. $25.00. JC8899. Calcite (manganoan). Pachapaqui district, Bolognesi province, Ancash department, Peru. 6 x 8 x 10 cm 560g. $185.00. 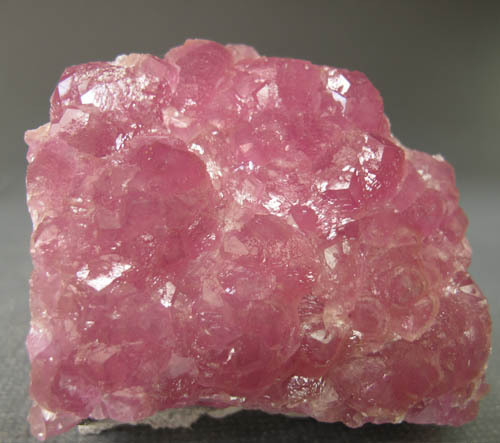 A bright, light pink mass of crystals. Unusual to get this bright a luster on manganoan calcites from here. A superior specimen. JC8900. Calcite (manganoan). Dal'negorsk, Kavalerovo mining district, Primorskiy Kray, Far Eastern Region, Russia. 9.5 x 10 cm 383g. $180.00. A 8.5 cm crystal. Somewhat flattened rhombohedron. JC8901. Calcite (manganoan). Huanggang Mine, Hexigten Banner, Inner Mongolia A.R., China. 9 x 9 cm 540g. $180.00. Nice group of rhombohedral crystals rather than the more common "wheat sheaf" type seen from here. JC8913. Calcite, pyrite. Pribram, Central Bohemia region, Bohemia, Czech republic. 9 x 14 cm 628g. $175.00. Nice clean group of crystals with small scattered pyrite over them. Mines closed in 1991, so this predates that. Has a rather old looking label with it. Label looks to be more than 30 or so years old. JC8772. Calcite. 2nd Sovietsky mine, Dal'Negorsk, Russia. 7 x 10 cm 184g. $200.00. A 4 cm crystal, rather flattened, with some side crystals. Pretty specimen. JC8644. Calcite. Red Dome mine, Mungana, Mareeba Shire, Queensland, Australia. 6 x 9.5 cm 129g. $35.00. 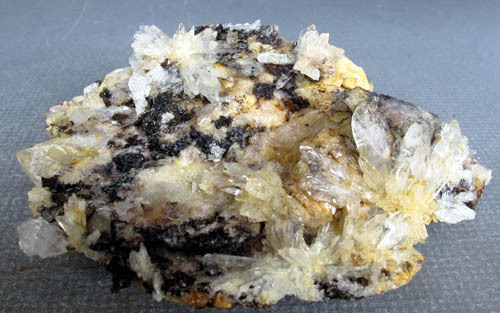 Several crystals formed on corroded earlier calcite with limonite. JC8621. Calcite. Ojuela mine, Mapimi, Durango, Mexico. 7 x 9 cm 342g. $75.00. This is a beautiful calcite for the Ojuela mine. The photos do not even come close to representing this piece. The crystals are nearly transparent flattened rhombohedrons of brilliant luster. Larger on the top and sides (to 4 cm) and smaller in the center. The whole thing is scintillating bright. Much better in person. JC8602. Calcite. Jalgaon district, Maharashtra, India. 6.5 x 7 cm 221g. $75.00. A 4.8 cm modified rhomb. Mostly transparent. Minor dings here and there as tiny white spots. Tungsten light for this shot. JC8602. Another view. Daylight photo. JC8479. Another view. The odd doubly terminated portion is visible in this shot. JC8368. Calcite (cobaltian). Aghbar mine, Bou Azzer, Tazenakht, Ourzazate province, Souss-Massa-Draa region, Morocco. 3.3 x 6 cm 111g. $35.00. Lilac color, sharp, sparkly, scalenohedral crystals. Color is more lilac than pink. Bottom photo is closest to true color. JC8202. Calcite. N'Chwaning II mine, N'Chwaning mines, Kuruman, Kalahari manganese field, Northern Cape province, South Africa. A 2.5 cm crystal with smaller satellite crystals. Totally transparent and gemmy. Very tiny dings on the small right hand satellite crystal. The double refraction of calcite gives rather odd looking inclusions a strange look. Nice piece. JC8201. Another view. The tiny dings on the left hand satellite crystal in this view, are barely visible. JC8204. Calcite. N'Chwaning II mine, N'Chwaning mines, Kuruman, Kalahari manganese field, Northern Cape province, South Africa. 2 x 2.5 cm $10.00. A transparent nicely twinned crystal on a bit of matrix. A very tiny ding on one edge, visible with a loupe. JC8205. Gypsum. N'Chwaning II mine, N'Chwaning mines, Kuruman, Kalahari manganese field, Northern Cape province, South Africa. A 3 cm rather complex crystal. $3.00. Cleaved on one side. JC8208. Calcite. N'Chwaning II mine, N'Chwaning mines, Kuruman, Kalahari manganese field, Northern Cape province, South Africa. 3 x 5 cm 23g. $20.00. Totally transparent crystals with interesting crystal forms. A few very minor dings, hard to spot, and do not detract. None visible in the photos. JC8210. Calcite. N'Chwaning II mine, N'Chwaning mines, Kuruman, Kalahari manganese field, Northern Cape province, South Africa. 4 x 4.3 cm 27g. $15.00. Transparent, satiny to glassy luster crystals. One cleaved crystal on the upper left edge of the specimen in this view. JC8211. Calcite. N'Chwaning II mine, N'Chwaning mines, Kuruman, Kalahari manganese field, Northern Cape province, South Africa. 4.3 x 4.5 cm 27g. $20.00. 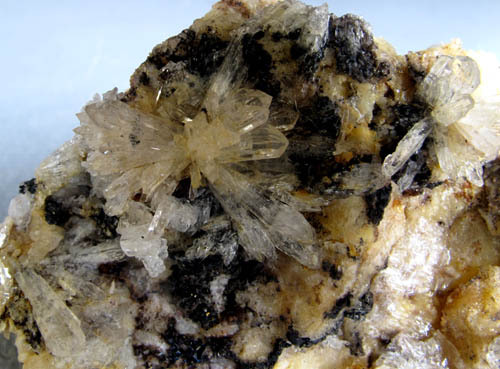 A 3.5 cm doubly terminated crystal with a few smaller associated crystals. A few very minor dings along the crystal edges, hard to spot and not visible in the photos. JC8212. Calcite. N'Chwaning II mine, N'Chwaning mines, Kuruman, Kalahari manganese field, Northern Cape province, South Africa. A 3cm crystal. 8g. $10.00. A doubly terminated transparent crystal. There is one ding about dead center on the crystal face, visible as a white spot on the crystal in this view. 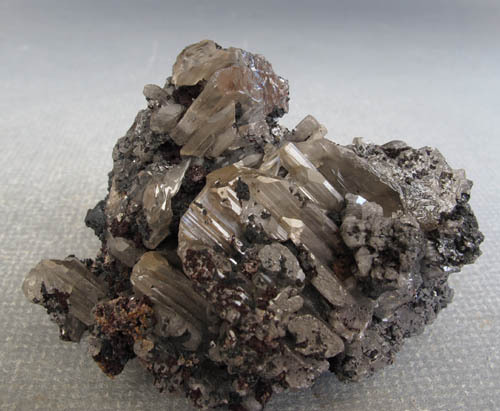 Little specks of black manganese oxide are present on the crystal faces, visible in the photos. JC8212. View of back side. JC8213. Calcite. N'Chwaning II mine, N'Chwaning mines, Kuruman, Kalahari manganese field, Northern Cape province, South Africa. A 4 cm crystal. 13g. $25.00. Totally transparent and gemmy with matrix inclusions, and a bit of matrix on the back side. Doubly terminated. Nice specimen. JC8213. Another view, back side. .
JC8213. Another view, back side. JC8215. Calcite. N'Chwaning II mine, N'Chwaning mines, Kuruman, Kalahari manganese field, Northern Cape province, South Africa. 2.5 x 4 cm 18g. $15.00. Modified rhombohedrons, transparent to translucent. JC8216. Calcite. N'Chwaning II mine, N'Chwaning mines, Kuruman, Kalahari manganese field, Northern Cape province, South Africa. A 2.7 cm crystal. 5g. $15.00. Totally transparent. I found two very small dings. One on the tip of the crystal, visible on the left termination end in this photo as a white spot. JC8218. Calcite. N'Chwaning II mine, N'Chwaning mines, Kuruman, Kalahari manganese field, Northern Cape province, South Africa. 4 x 4 cm 36g. $10.00. A mostly transparent oddly twinned crystal. There is a blemish, doesn't appear to be damage though, on the lower front in this photo. Looks like a white spot in the crystal. A couple of minor dings on crystal edges, not visible in the photos as they are quite small. JC8218. Another view. The blemish is white in this photo...it actually is inside the crystal. Minor ding visible on the upper somewhat right of center part of the crystal. JC8220. Calcite. N'Chwaning II mine, N'Chwaning mines, Kuruman, Kalahari manganese field, Northern Cape province, South Africa. A 3 cm crystal. $18.00 Single termination, with cleaved base. Totally gemmy crystal. JC8221. Calcite. N'Chwaning II mine, N'Chwaning mines, Kuruman, Kalahari manganese field, Northern Cape province, South Africa. A 2.2 cm crystal. $15.00. Totally gemmy, single termination, crystal. Base is matrix material. Tiny ding on one edge, not noticeable without a loupe. JC8224. Calcite. 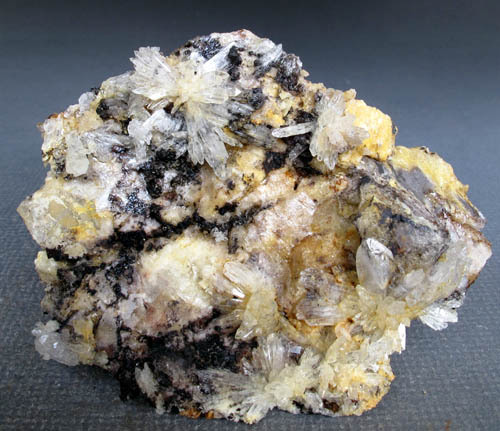 N'Chwaning II mine, N'Chwaning mines, Kuruman, Kalahari manganese field, Northern Cape province, South Africa 2.5 x 4.5 cm 25g. $25.00. Highly modified crystals; not being a crystallographer, not sure how to describe this one. Neat specimen. Transparent crystals with glassy to satiny luser. JC8225. Calcite. N'Chwaning II mine, N'Chwaning mines, Kuruman, Kalahari manganese field, Northern Cape province, South Africa. 2 x 2.7 cm 10g. $20.00 Highly modified, glassy, transparent, gemmy crystals. JC8226. Calcite. N'Chwaning II mine, N'Chwaning mines, Kuruman, Kalahari manganese field, Northern Cape province, South Africa. 6.4 cm long group. 13g. $15.00. Interesting group of scalenohedrons. The longest, main crystal has a cleaved tip. JC8226. Another view, with the cleaved tip of the main crystal visible, right end of the crystal. JC8227. Calcite. N'Chwaning II mine, N'Chwaning mines, Kuruman, Kalahari manganese field, Northern Cape province, South Africa. 2.5 x 5 cm 35g. $15.00. Tiny ding on the end of the main crystal. Satiny luster, translucent crystals. .
JC8184. Calcite. Dal'negorsk, Kavalerovo mining district, Primorskiy Kray, Far-Eastern region, Russia. 5.5 x 8.5 cm 147g. $35.00 A 5 cm crystal with a cleaved termination on end. JC8178. Calcite, fluorite. Denton mine, Goose creek mine group, Harris Creek sub-district, Illinois-Kentucky Fluorspar district, Hardin county, Illinois. 5.5 x 9 cm 364g. $125.00. Large amber calcite crystal with a bit of fluorite attached. Several minor dings present and can be seen as little white spots on the crystal. ON SALE, TAKE 20% OFF THE MARKED PRICE. JC8178. Another view. The partial fluorite crystal can be seen on the lower left. JC8171. Calcite. San Martin mine, San Martin-Sabinas district, San Martin, Mun. de Sombrerete, Zacatecas, Mexico. 4.5 x 6.5 cm 173g. $120.00. Pale lavender crystals of calcite on matrix. The mine is noted for these lightly colored calcites, which are rarely seen for sale. A fine example. One crystal on this piece is cleaved. JC8023. Calcite. Egremont, West Cumberland Iron Field, Cumbria, United Kingdom. 4.5 x 4.5 cm 52g. $100.00. A single crystal of a sort of flattened rhomboid supported by smaller crystals. Ding on the top edge, easily seen in the photos. JC7740. Calcite, quartz. Freiberg, Erzgebirge, Saxony, Germany. 2.5 x 5.5 cm 41g. $60.00. A 4 cm crystal with quartz crystals on the back side. A very slight hint of violet color to the crystal. Good sharp crystal, not common on the market these days. JC7404. Calcite (cobaltian). Aghbar mine, Bou Azzer, Tazenakht, Ourzazate province, Souss-Massa-Draa region, Morocco. 6.5 x 9 cm 302g. $65.00. Bright pink crystals on a shallow mound. Sawn back. Two top views and one side view are shown. Nice luster. JC7390. Calcite (cobaltian). Mashamba West mine, Zaire (Democratic Republic of the Congo). 6 x 7 cm 282g. $200.00. Intense magenta color crystals. Wow color, slightly darker than the photo would show. JC7245. Calcite (cobaltian). Aghbar mine, Bou Azzer, Tazenakht, Ourzazate province, Souss-Massa-Draa region, Morocco. 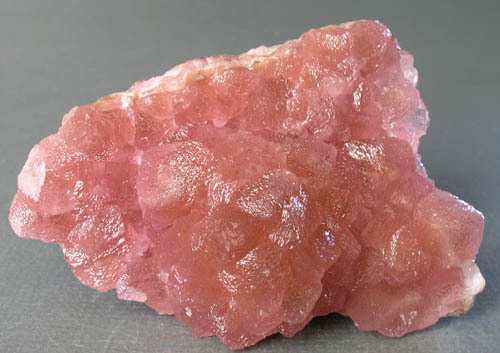 6.3 x 7 cm 200g $200.00 Prismatic crystals of pink to salmon pink crystals. Two views are shown. Nice piece. JC6777. Calcite (cobaltoan). Aghbar mine, Bou Azzer, Tazenakht, Ourzazate prov., Souss-Massa-Draa region, Morocco. 5 x 7.5 cm 210g. $100.00. Pretty pink, rounded in appearance crystals. JC5712. Calcite (cobaltoan). Aghbar mine, Bou-Azzer district, Tazenakht Ouarzazate prov., Souss-Massa-Draa region, Morocco. 5 x 8 cm 188g. $90.00. 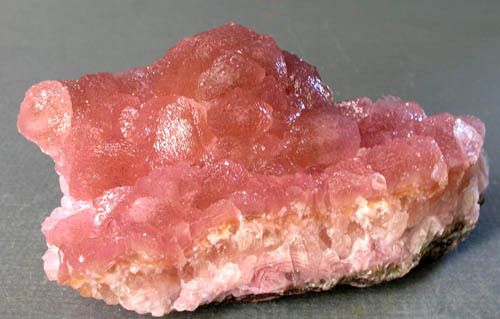 A beautiful pink group of crystals. Two views are shown. Good luster as can be seen in the photo. There is some very slight rubbing of the top crystals when turned in the light...very hard to see, but I wanted to mention it. JC9757. Celestine. Stoneco Lime City quarry, Lime city, Wood county, Ohio. 4 x 6 cm 126g. $15.00. Pale blue, translucent crystals on dolomitic matrix. JC9429. Cerussite. Monteponi mine, Iglesias, Carboni-Iglesias province, Sardinia, Italy. 7 x 9 cm 576g. $249.00. A solid mass of jackstraw crystals. More known for its anglesite and phosgenite, the locality has also produced outstanding aggregates of crystals in the distant past. This is a fine example of jackstraw cerussite from there; a solid and heavy mass of cerussite. Ex Jordi Povill collection. A rare specimen indeed. JC9429. Another close up view. JC9430. Cerussite. Monteponi mine, Iglesias, Carboni-Iglesias province, Sardinia, Italy. 7 x 10 cm 532g. $199.00. A nearly solid mass of jackstraw crystals on massive quartz. More known for its anglesite and phosgenite, the locality has also produced outstanding aggregates of crystals in the distant past. This is a fine example of jackstraw cerussite from there; a solid and heavy mass of cerussite. Ex Jordi Povill collection. A rare specimen indeed. JC9284. Cerussite. Tsumeb mine, Tsumeb, Namibia. 4 x 5 cm 56g. $5.00. Somewhat damaged cerussite on matrix. Not the best photo. JC8864. Cerussite. Tsumeb, Namibia. 3.5 x 4 cm 69g. $75.00. Reticulated crystal group. JC8764. Cerussite. Broken Hill Proprietary mine, Broken Hill, New South Wales, Australia. 4 x 5 x 8 cm 269g. $150.00. a nice old time group of crystals collected many years ago. JC8585. Cerussite. Tsumeb, Namibia. 3 x 3.5 cm 54g. $25.00. Dings on left edge and backside. JC8585. Another view, showing one of chips taken out on the left top. JC8150. Cerussite. Tsumeb mine, Tsumeb, Namibia. 4 x 9 cm 145g. $50.00. 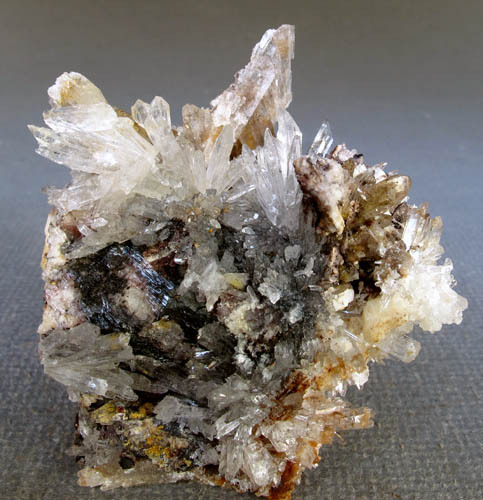 A vug in decomposed galena is lined with cerussite crystals. One larger crystal is present on the top left in this photo. A little different from the usual cerussite crystals perched on various minerals. JC8034. 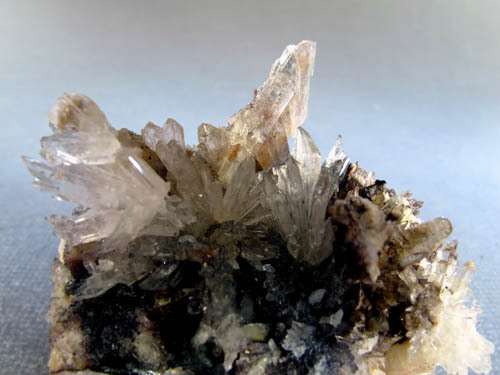 Cerussite on galena. Tsumeb, Namibia. 3.5 x 5 cm 79g. $75.00. 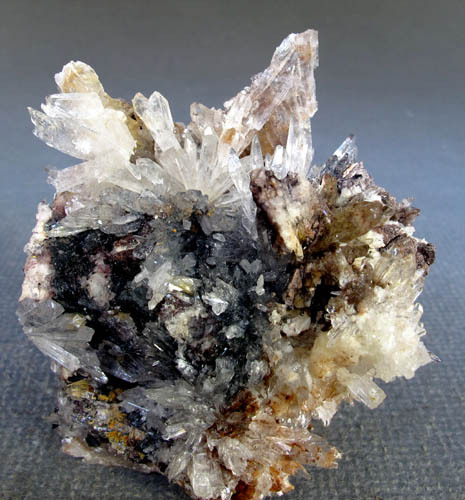 Rarely was galena ever found in crystals. Here are several corroded crystals with small cerussite crystals implanted on them. JC8006. Cerussite, mimetite. Tsumeb mine, Tsumeb, Namibia. 3.5 x 3.5 cm 58g with stand. $50.00. A rounded cerussite crystal has scattered bright yellow mimetite crystals on it. JC7842. Cerussite, smithsonite. Tsumeb mine, Tsumeb, Namibia. 3 x 5 cm $50.00. JC7846. Cerussite. Zeehan district, Tasmania, Australia. 2 x 3.5 cm $30.00. A nice sharp group of crystals. JC7662. Cerussite. Tsumeb, Namibia. 3 x 5 cm 120g. $30.00. A somewhat incomplete group. Front and back side is shown. JC6930. Cerussite. Tsumeb mine, Tsumeb, Namibia. 5 x 6.5 cm 150g. $50.00 Gray cerussite on black matrix. Collected mid 1970's. JC6940. Cerussite. Flux mine, Harshaw dist., nr Patagonia, Santa Cruz county, Arizona. 5 x 7.5 cm $10.00 Cream color crystals with a very faint yellowish green hue, on a rather friable goethite matrix. JC6685. Cerussite. Kapi mine, North Dundas, Zeehan district, Tasmania. 5 x 7 cm 92g. $150.00. Silky, near solid coating of crystals on matrix. Cerussite specimens in this size are not often seen on the market from the Kapi mine. More famous for its yellowish chrome cerussite, this one is fairly light colored. JC5781. Cerussite. Daoping lead-zinc mine, Goncheng county, Guilin prefecture, Guangxi Zhuang autonomous region, China. 4.5 x 8 cm 143g. $125.00. A bright group of crystals exhibiting various forms. Crystals are glassy and highly translucent. Lots of sparkle. They look quite similar to the cerussite that came from the 9 Level, Jersey vein, of the Bunker Hill mine in Idaho around 1982. JC5065. Cerussite. Daoping Lead-Zinc mine, Guangxi prov., China. 6 x 8 cm 389g. $125.00. A tough one to photograph, as the crystals blend together. Has reticulated crystals, bladed crystals, and "snowflake" crystals all together. One of the brighter, prettier cerussites I've seen from here. Two views are shown to try to get an idea of the myriad crystals composing this specimen. Reminds me of the old 9 level cerussites from the Bunker Hill mine that came out in the 1980's. This one will be mailed packed in soap powder due to its fragility. JC4586. Cerussite, malachite. Rum Jungle, Northern Territory, Australia. 4 x7 cm 64g. $50.00. White/beige crystals on malachite. ON SALE, TAKE 20% OFF THE MARKED PRICE. JC9070. Amethystine, grape agate/grape chalcedony? Manakarra beach?, West Sulawesi, Indonesia. 7 x 9 cm 137g. $125.00. There was quite a bit of this stuff scattered around the Tucson show, 2018. The only definitive location is Sulawesi...I have not seen an exact verified location as yet. Manakarra beach is consistant amongst several dealers, so for now I'm going with that. The poorer quality material is off color, with the better stuff a nice lavender/amethyst color. The poorer material does not have any luster, whereas the better material has a nice shine of minute, microscopic, quartz? that makes up the chalcedony. Prices are all over the place, and surprisingly high considering the abundance of material. I picked up two, with nice luster and color of intermediate quality. The better (and very expensive) material have no broken botryoids on them. These two have some broken botryoids...not sure if I would call it damage or not, just where other botryoids were attached. JC7896. Chalcopyrite, quartz. Yaogangxian Mine, Yaogangxian W-Sn ore field, Yizhang Co., Chenzhou Prefecture, Hunan Province, China. Daylight shot. 5 x 7.5 cm 45g. $100.00 A 1.5 cm crystal with iridescent tarnish perched on quartz crystals. JC7896. Another view. Daylight shot. JC7663. Chlorargyrite. Broken Hill mine, Broken Hill, Yancowinna Co., New South Wales, Australia. 3 x 5.5 cm 44g. $60.00. 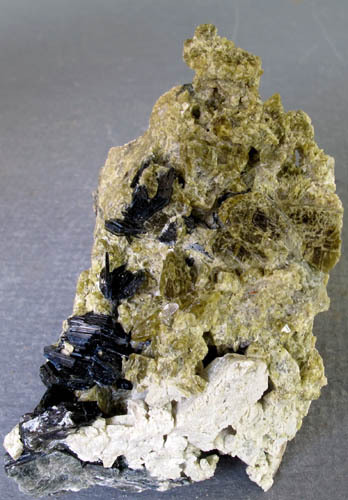 The chlorargyrite shows as the white patch at the top of the specimen. Pretty much anhedral crystals. JC8604. Cinnabar, quartz. New Almaden mine, Almaden Quicksilver county park, New Almaden, New Almaden district, Santa Cruz mountains, Santa Clara county, California. 6 x 8.5 cm 214g. $200.00 Rarely ever are cinnabar specimens available from this long closed locality. This is an unusually good piece with acicular crystals running in a vein along the lower front of the piece. The cinnabar crystals are mostly coated with a thin layer of micro-crystalline quartz. A fine specimen for this locality. JC8604. Another view, shot with tungsten light. JC7158. Cinnabar, Almaden mine, Ciudad Real, Spain. 6 x 7 cm 116g. $35.00. A solid mass of bright red cinnabar. A little sparkly drusy quartz on the front for sparkle. JC7160. Cinnabar, Almaden mine, Ciudad Real, Spain. 4 x 7.5 cm 113g. $30.00. A solid mass of cinnabar with a bit of unknown black mineral. JC6247. Clinachlore? and diopside. Iron Mask (Spring Gulch, Valley View) mine, Quartzite (White Rock) canyon, Spring Mountain district, nr. Big Windy Peak, Lemhi county, Idaho. 3 x 6 cm 63g. $5.00 Subhedral diopside with dark green clinachlore and an unknown pseudomorph on the bottom near the clinachlore. JC9346. Clinozoisite. San Cristobal hill, Canete, Lima department, Peru. 6 x 8.5 cm 309g. $50.00. Crystals are from 2.5 cm and smaller. There seems to be a little bit of confusion as to the exact locality for these. A different dealer had these as from the recent find of epidote from Canete...said they were very close to the epidote find. Nice size clinozoisite for Peru. Crystals are a beige with hints of green and gray. A recent find, new to me, however they were present at the Munich show this past fall of 2017. JC9347. Clinozoisite. San Cristobal hill, Canete, Lima department, Peru. A 3.2 cm tall crystal. $15.00. There seems to be a little bit of confusion as to the exact locality for these. A different dealer had these as from the recent find of epidote from Canete...said they were very close to the epidote find. Nice size clinozoisite for Peru. Crystals are a beige with hints of green and gray. A recent find, new to me, however they were present at the Munich show this past fall of 2017. JC9348. Clinozoisite. San Cristobal hill, Canete, Lima department, Peru. A 4 cm tall crystal. $18.00. There seems to be a little bit of confusion as to the exact locality for these. A different dealer had these as from the recent find of epidote from Canete...said they were very close to the epidote find. Nice size clinozoisite for Peru. Crystals are a beige with hints of green and gray. A recent find, new to me, however they were present at the Munich show this past fall of 2017. JC8916. Clinozoisite. Rosario Mabel mine (Flor de Peru II claim), Pampa Blanca district, Castrovirreyna province, Huancavelica department, Peru. 6.5 x 7 cm 287g. $40.00. A one time find, and small occurrence of these beige/honey colored crystals. The location may not be the Rosario Mabel mine itself, but a small occurrence nearby. No mention of this find on Mindat. These came out about the same time as the epidote crystals from this locality, which were abundant several years ago. One dealer has these as the Angelina II mine in this area. JC8916. A close up view. JC8918. Clinozoisite. Rosario Mabel mine (Flor de Peru II claim), Pampa Blanca district, Castrovirreyna province, Huancavelica department, Peru. 6.5 x 7 cm 287g. $40.00. A one time find, and small occurrence of these beige/honey colored crystals. The location may not be the Rosario Mabel mine itself, but a small occurrence nearby. No mention of this find on Mindat. These came out about the same time as the epidote crystals from this locality, which were abundant several years ago. One dealer has these as the Angelina II mine in this area. JC9042. Conichalcite. Gold Hill mine, Gold Hill, Gold Hill district, Deep Creek mountains, Tooele county, Utah. 5 x 7.5 cm 155g. $60.00. Sparkling, bright green coating on matrix. Nice color. JC8631. Copper, datolite. Keweenaw peninsula, Michigan. 5 x 7 x 9 cm 506g. $150.00. A heavy specimen with poorly formed copper crystals and anhedral copper interspersed through the datolite. Judging by the weight, if the datolite were removed the piece would show far more copper than this photo. JC7680. Copper. Levant mine, Trewellard, St. Just, St. Just district, Cornwall, United Kingdom. 6 x 10 cm 220g $175.00. Copper leaf crystals on calcite. Rare old timer. JC8010. Copper. Itauz mine, Zhilandy group, Karagandy province, Kazakhstan. 3.5 x 5 cm 6g. $180.00. Nice, distinct crystals with esthetic appearance. ON SALE, TAKE 20% OFF THE MARKED PRICE. JC7661. Copper, calcite. Onganja, Seeis, Windhoek District, Namibia. 2.7 x 5.6 cm tall. 39g. $125.00. Nice group of copper crystals on calcite. On the back side of the specimen is a calcite cleavage fragment that has cuprite inclusions, showing up as the red "crystal" on the upper left of this photo. ON SALE, TAKE 20% OFF THE MARKED PRICE. JC8041. Coquimbite. Javier mine, Huachuas, Lucanas province, Ayacucho dept., Peru. 3.5 x 3.5 cm 14g. $25.00. Nice lavender crystal. ON SALE, TAKE 20% OFF THE MARKED PRICE. JC8844. Creedite. Hall molybdenum mine, San Antone district, San Antonio mountains, Nye county, Nevada. 3 x 5 cm 53g. $15.00. A couple of sprigs of pale lilac colored creedite. Location has been closed for several years, and no more specimens have been forthcoming. JC7033. Creedite. Qinlong (Dachang), Qinglong county, Guizhou province, China. 5 x 7 cm 109g. $100.00. Nice grouping of colorless to white crystals. This locality appears to be already depleted. None have been on the market recently. ON SALE, TAKE 20% OFF THE MARKED PRICE. JC7033. Close up view of the top crystals. JC7034. Creedite. Qinlong (Dachang), Qinglong county, Guizhou province, China. 7 x 9 cm 137g. $80.00 A larger plate with several radiating clusters of colorless to white creedite crystals. ON SALE, TAKE 20% OFF THE MARKED PRICE. JC7034. An oblique view of the piece. JC7034. Close up of some of the creedite clusters. JC7034. Close up view of some of the sprays of crystals and the large crystal on the upper right. JC9437. Crocoite, gibbsite? Adelaide mine, Dundas, Tasmania, Australia. 14 cm tall x 18 cm wide x 9 cm deep. >1000g. $350.00 A large cabinet specimen. Bright orange crystals on the front, representing a 2nd generation of growth. 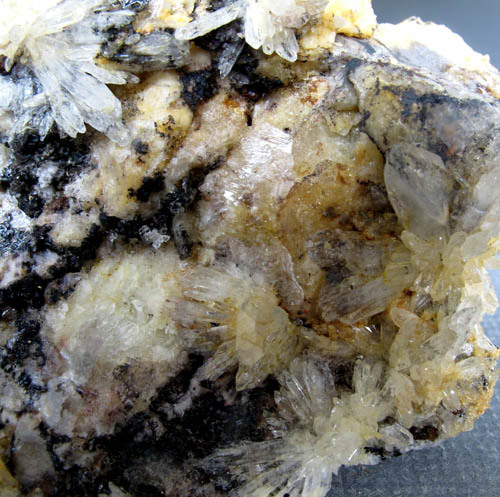 The 1st generation crystals are stouter and many are partially to completely coated by what appears to be gibbsite. An impressive piece that is almost all crocoite. The back side has about 1/3 of it with a limonite gossan material. JC9437. Close up of the top front. JC7643. Crocoite. Adelaide mine, Zeehan district, nr. Dundas, Tasmania, Australia. A 6 cm hollow crystal, with a termination on one end. $125.00. ON SALE, TAKE 20% OFF THE MARKED PRICE. JC7643. Oblique view. The hollow part of the crystal can be seen in the foreground, and the backside of the hollow part has a termination more easily seen in the photo below. JC7643. End view showing the termination. JC7549. Crocoite. Adelaide mine, Zeehan district, Dundas, Tasmania, Australia. 3.5 x 5.5 cm 21g. $40.00. 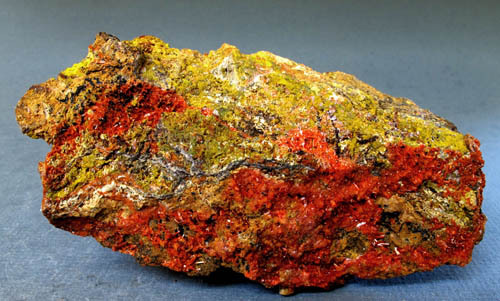 Crocoite with a partial coating of gibbsite. What is interesting is the dozens of tiny crocoite crystals sticking vertically out of the larger crystals like spines on a cactus. JC7343. Crocoite (on dundasite?). West Comet mine, Dundas, Tasmania. 6 x 11 cm 139g. $65.00. Dozens of terminated, satin luster, orange crocoite on what the label said is dundasite, but this is not verified. Collected in the 1970's. ON SALE, TAKE 20% OFF THE MARKED PRICE. JC6310. Crocoite. Callenberg, Glauchau, Saxony, Germany. 3.5 x 10 cm 371g. $125.00 Micro to 4mm crystals coating iron oxide matrix. Nice size cabinet piece from this rare locality. ON SALE, TAKE 20% OFF THE MARKED PRICE. JC6311. Crocoite. Callenberg, Glauchau, Saxony, Germany. 3 x 6.5 cm 57g. $80.00. Face covered with about 3mm crystals. ON SALE, TAKE 20% OFF THE MARKED PRICE. JC9062. Cuprite. Milpillas mine, Santa Cruz, Sonora, Mexico. 7 x 10 cm 285g. $175.00. Somewhat flattened, brilliant crystals, with red color (as seen) in daylight, brilliant silvery reflectance in reflected light. Some rubbing in center area, as can be seen better in the lowest photo. JC9500. Cuprite var. chalcotrichite. Morenci, Copper Mountain district, Shannon mountains, Greenlee county, Arizona. 6 x 8 cm 145.g. $250.00. Ex Tom Hales collection. Collected: 1985. Something I haven't run across before...a nice chalcotrichite specimen from Morenci. Red needle like crystals densely coating the whole face of the specimen. Rare specimen for this location. JC9500. Another view with a little more exposure.